Many times I imagine a large “Heavenly Game Room” where our Higher Selves are behind their computers with headphones on their ears or around their necks, legs on the table, drinks and snacks in front of them, talking to each other, laughing and having a lot of fun. From this game room, our Higher Selves give input to our Human Forms. As and when they receive feedback, they immediately start to work with what they’ve been given. Because the Higher Self is non-physical, it is not bound by space and time. 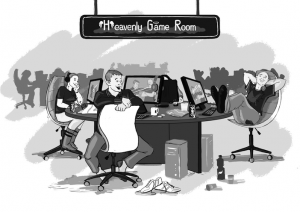 In other words, the Heavenly Game Room is always open and at our service, 24/7. Marc is leading a hectic life, running a successful radiator business. He wants to spend more time with his partner Sophie and with his family and friends, but there is always something in the business that keeps him away. His main worry is that he does not have enough money coming in to take care of his family. Higher Self Marc: “Ah, my Human Form, ‘little’ Marc, wants to spend more time with his partner Sophie, family, and friends. OK, I received that request and I’m happy to look for ways to bring this to him. Hmm, what if I had this customer cancel his order, which will free up some space in his calendar. Besides, that customer was not the best match anyway. Let’s ask the Higher Self of the CEO of that company, Fred, to play along. Back in the Heavenly Game Room. The next day, Fred calls Marc to tell him that there has been a mistake and that they didn’t want to cancel the order. Actually, they wanted to order more. The dark clouds in Marc’s head immediately disappear. In the evening he comes home and tells Sophie, “You will never guess what happened today. Fred called me personally to apologize. Apparently they made a mistake. The order is still on and they even placed an additional one! Let’s celebrate. Let’s go to a restaurant.” And they have a great evening together. A week later, Sophie comes home and tells Marc that she has won a vacation to Hawaii. Because that is a location Marc has always dreamt of, he immediately gets his calendar out and blocks two weeks. His mood changes even more. The phone call of Fred a week ago already lifted his spirits. The anticipation of being able to spend two weeks with his beloved partner on a beautiful location puts him in an even better mood. Every time I think about my life in the way I described in this example, I immediately have to laugh. It instantly lifts my spirits. The consequence is that it is much easier to relax the wicked warriors and look at the world in a different way!